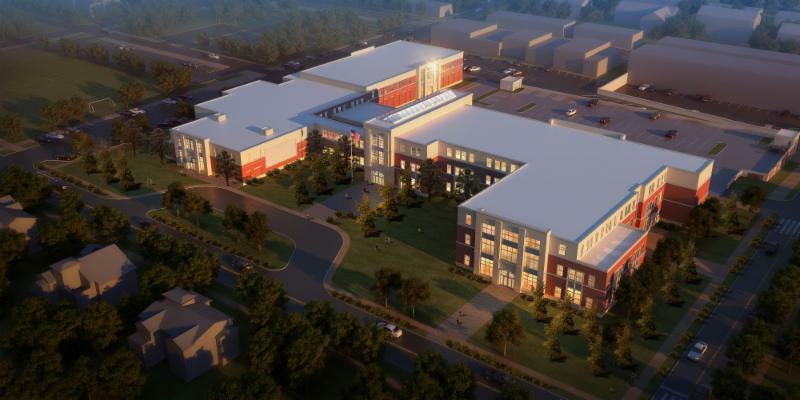 The new Hinsdale Middle School opens on time and below budget ! 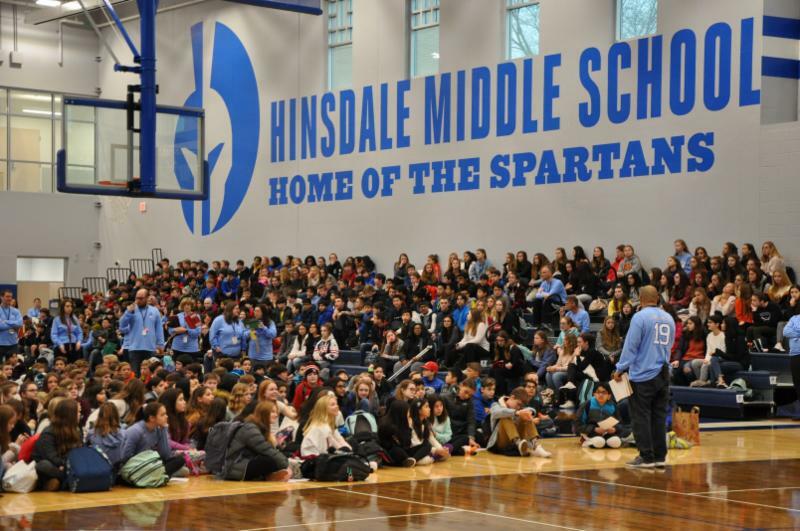 The new Hinsdale Middle School opened to students this month, on time and below budget. "For you to be the first students to learn in these classrooms, sit in these bleachers, and perform on these stages is very unique," said Principal Ruben Pena on the school's opening day earlier this month. "I cannot overemphasize the magnitude of this day." Located just south of the former school, the new one, designed by Cordogan Clark and built by Bulley & Andrews, provides 140,000 square feet of learning space designed for 21st century learners. 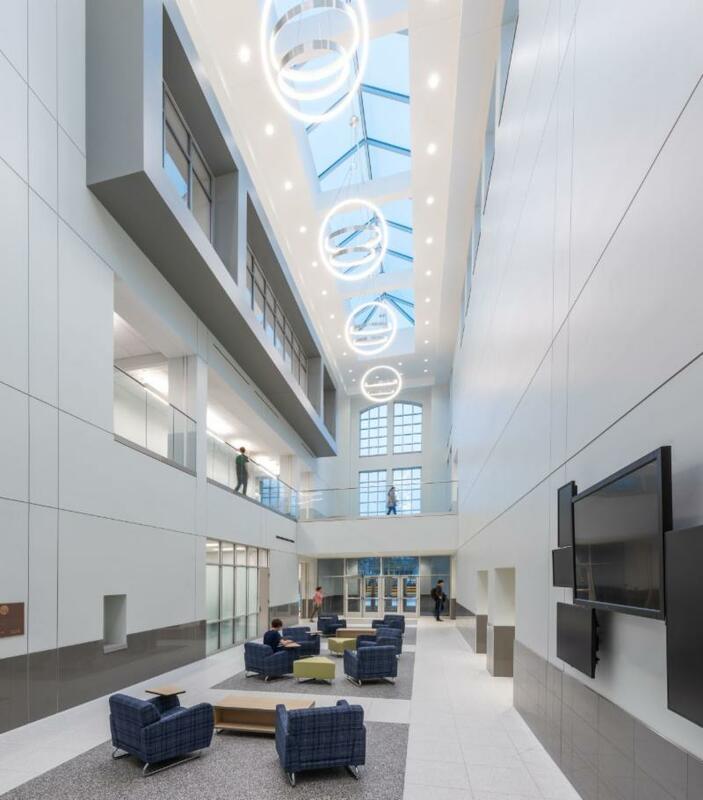 A three-story sky-lit atrium leads from the main entrance: Filled with natural light, it is the school's central "Main Street," providing convenient access to all key common spaces. The new building features: 28 Core Classrooms; 6 Science Laboratories;10 Resource Small Classrooms; a 15,000-square-foot Gymnasium; a Cafetorium; Large Band, Orchestra and Choral Rooms; Music Ensemble Practice Rooms; Music Faculty Office; Media Resource Center and Maker Space; Fine Arts Laboratory; Ceramics Kiln; Outdoor Classroom with Projection Surface; and a Green Roof. The six modern 1,400-square-foot Science Laboratories feature wet labs and lecture areas with flexible furniture, polished concrete floors and open ceilings. Each lab is equipped with collaboration technology equipment and a demonstration table camera allowing experiments to be cast on the projection surface. In keeping with 21st century educational objectives, the school also features a spacious Gymnasium designed for active learning. The Gymnasium has NBA-quality wood floors, and A/V equipment to support school assemblies and events. A 1,500 square foot mezzanine overlooking the gym is outfitted with exercise equipment. The gym bleachers seat more than 830, and 1,400 with floor seating. The Cafetorium can seat 650 people for a performance and 300 for lunch. 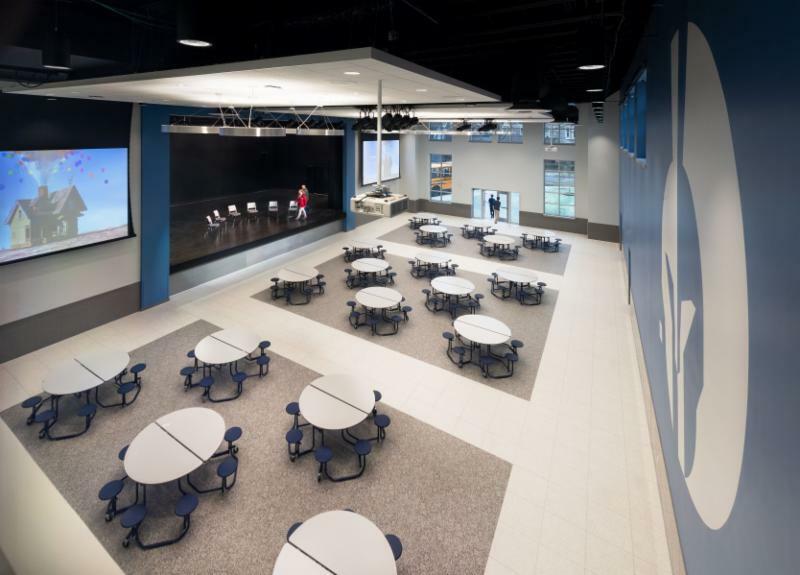 Designed with acoustics in mind, the Cafetorium has a full-size stage, with a thrust stage for audience-forward productions. It can double as an additional choral room when the partition is drawn. Adjacent to the cafetorium is a full-service production kitchen and modern servery with two serving lines. The Media Resource Center has full modern library functions and contemporary soft seating. Designed as a hub for students, the resource center has designated collaboration zones and a Maker Space where students can work with technology such as 3-D printer and laser cutter. Attached to the Maker Space is an up-to-date green room for video production. The Music Spaces all feature high ceilings, large exterior windows, state-of-the-art sound reproduction capabilities, and A/V educational delivery equipment. Throughout the school, large windows provide generous natural light. Collaborative seating located throughout the building invites students and faculty to engage in small group learning and conversation. The exterior is accented with brick and stone that is contextual with and enlivens its setting. The new school creates a "sense of place" that encourages active, collaborative learning. The students' excitement on their first day showed that they take pride in their new school. Their pride, coupled with their new educational environment, will foster lasting success. Though the students were the top priority in design, the architecture also responds to the community of Hinsdale at large. The exterior design is contextual with historic Hinsdale. Its many windows are framed with warm colored brick and stone, creating a unique piece of architecture that enlivens its setting and provides an architectural focus for the community. "I had the pleasure of attending the opening of the school last week." said Board of Education President Jennifer Burns. "And I have to say, 'WOW!' to say it's a beautiful building just doesn't do it justice!" "This is the most amazing space I've ever taught in," said Jane Fetty, an eighth-grade science and history teacher who is in her 18th year at HMS. "This building is bright and open. I think it will be a healthier, happier environment for our students." "I'm thrilled," said a student's mother. "It's been a long time coming, and it's something our students deserve. The old school was tired."